If you are headed for the Zoo or maybe for Belfast Castle, then Fortwilliam Pizzeria is in the same direction as you are going. So maybe before arrival, or after a long day walking in the zoo with your children, Fortwilliam Pizzeria is the perfect place to go. Italian food is always success when eating together as a family, and everyone can find food they like (not always too easy in seafood restaurants). 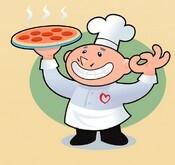 If you have been to this restaurant, please write a comment using the comment field!